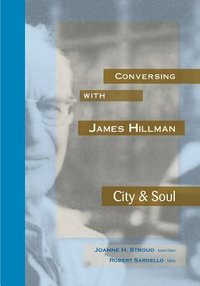 We might begin by asking why did James Hillman talk and write enough about the city to fill an entire volume, City & Soul, of his Uniform Edition? [In] America in the late twentieth century we had grown careless and had allowed so many of our major metropolises to fall into decline. One of the unique contributions to Western civilization that the city-state of Athens made in the classic era was appreciation for the cohesion of the city. . . .[We] kept reimagining what a city, a lively one could be. We reminded ourselves that it was indeed possible to bring back the bustling energy that had fled the center. . . . Not only does James Hillman have much to add to the knowledge of the experience of life in the city, but he also leaves us with much to further question. My hope is that this new book, Conversing with James Hillman, will provide that opportunity for readers. - Joanne H. Stroud From the James Hillman Symposium held at The Dallas Instititue of Humanities and Culture on his book City & Soul - Hillman's writings on the psychology of public affairs: urbanism, environmental aesthetics, citizenship, and politics. The essays and talks divide into four groups: Patient as Citizen; Politics of Beauty; Places of Practice; and Responsive Environmentalism. (color images of the symposium) Conversing with James Hillman includes works by: James Hillman, Gustavo Barcellos, Gustavo Beck, Scott Becker, Tom Cheetham, Matthew Green, Nor Hall, Jonathan Harrell, Sarah Jackson, Robert Leaver, Klaus Ottmann, Robert Romanyshyn, Cheryl Sanders-Sardello, Robert Sardello, Randolph Severson, Dennis Slattery, Joanne H. Stroud, Rodney Teague, and Gail Thomas.